This incredible, first-generation XKE Fixed Head Coupe has undergone a comprehensive rotisserie restoration to the highest possible standards, with the ultimate goal of achieving show level authenticity and condition. This FHC, Car #885041, benefited from a daunting 2-year plus restoration, during which the owner himself took charge and assisted sourcing NOS and great authentic parts to be installed during the restoration process. As the parts started coming in from sources worldwide, our team inspected, tagged and labeled them accordingly. The owner was highly determined to create the most correct 1961 E-Type possible, and emphasized that to us in planning the restoration of his car. So much so, that he not only provided our team one part but also an assortment of the same part, enabling us to hand pick the very best and most proper part for this example. More than anything, the customer wanted this car to be correct in every sense of the word, regardless of the cost. We were in perfect harmony with the customer’s request, which just so happens to be our method of performing show-level restorations. The car arrived at our facility on a trailer in boxes and pallets, with most of the car already disassembled. We fully documented, photographed and inspected the car. The body was then stripped to bare metal, placed on a rotisserie for the body work, and metal finished and leaded. All body parts, bright work, and rubber were fitted to the car in bare metal; after that process, we removed all body parts, bright work and rubber to prepare the car for paint. We then applied primer, sealer, base coat, and clear coat. All parts were individually painted off the car in the booth. Finally, a few days later after curing, we color sanded and buffed the E-Type to the beautiful finish you see before you today. We matched the Opalescent Gunmetal paint to an original Jaguar paint swatch from the 1960s. With the body and paint process for this Coupe now completed, its restored and new parts entered our Assembly Area, where our experienced team of craftsmen began assembling the various mechanical components to their factory specifications. Included were the engine block and head, transmission, rear end assembly, and all vital systems, including: electrical, cooling, fuel, and hydraulic. The engine accessories including SU carburetors, starter motor, and dynamo were rebuilt, as were every other component. All other items and components for Car #041 were either restored or replaced, with their proper finishes. English head bolts were used throughout the car. EXTERIOR: new windshield, 1961 OEM door glass, wiper arms and Lucas PR Rainbow wiper blades, front parking lights with early fluted lenses and rear brake light lenses, reverse light lens, license plate light assembly, motif badge and bracketry, chrome screws for headlight rings, and highest-level restoration of exterior and interior bright work, then all were trial fitted before painting and then re-assembled onto the car. This early XKE sports new Dunlop tires, painted 72-spoke wire wheels, knock-offs, and much more. INTERIOR: restored original steering wheel with original horn push button , rebuilt gauges, switches, and knobs, dash top, speaker grilles, glove box, Hickok seat belts, emblems, gear shift knob, chrome bezel around the shifter, rubber floor mats (over carpet), a new turn signal assembly, window mechanisms and door regulators restored and installed with proper hardware and shims, restored grab handle and under dash panels installed with all proper hardware and fasteners, re-manufactured early Radiomobile 500T radio. UNDER THE BONNET: everything on the inside and the outside of the bonnet has been restored back to its original condition. Every single weld and all early wide flanges, under panel assembly, front diaphragm assemblies, valence and air duct assemblies, frame rails, and original picture frame stamped 885041 were incorporated using an original 1961 bonnet as a template. A new highly accurate reproduction Battery along with its proper cables and original hardware bracketry was installed. Then, a new finned aluminum radiator was fitted, followed by header tank with hoses and clamps, radiator cap, thermostat, porcelain exhaust manifolds, heater valve, all electrical relays and systems, restored heater system, and firewall water pipe as well as all rubber, grommets, seals, hardware, and more. OEM components date-stamped before 18 September 1961: windscreen wiper motor, windscreen washer motor, fan relay, fan motor, dynamo, brake and clutch cylinder tags, original SU carburetors, distributor, Lucas HA 12 coil. IN THE BOOT: A new epoxy-sealed gas tank is equipped with a new internal fuel pump installed inside the tank with the proper gasket and related accessories and hardware. In addition, an electrical junction box with the proper plaque located on the boot bulkhead was added. A clip was attached to the floor to accommodate a Shelley jack handle. A correct early Shelley jack and a beautiful tool kit with all authentic tools are included. UNDERCARRIAGE: The steering rack assembly was restored, as was the suspension, CAD plated, and new bushings installed, as well as ball joints and tie rod ends, etc. The driveshaft was restored with new U-joints, and new shock absorbers were installed with bushings. Then, a new mild steel exhaust system was hung using its proper clamps and hardware along with show-quality resonator tips. AFTER ASSEMBLY: Once the assembly process for Car #041 was completed, we aligned the front and rear end before its first test drive. The Master Technician then performed a number of brief test drives over several days, and adjusted the FHC making sure it is torqued to proper specifications. After each test drive, the vehicle was elevated on a lift, which enabled further inspections of the undercarriage, under the bonnet, and the integrity of the entire vehicle. After the restoration was completed, the owner sought to Pedigree the car and schedule it for competition judging and showing at 3 sanctioned JCNA Concours events in California, where it achieved 3 consecutive 100-point First Place awards. With these spectacular results, this exceptional XKE received the 2016 First in Class National Champion Award at JCNA’s Annual General Meeting. The car was then returned to the owner’s storage facility, where he continued to campaign the Coupe in local JCNA sanctioned events in 2017, once again achieving perfect scores in its respective class. XKE 885041 extended its exceptional competition record by winning First in Class at JCNA's toughest conours competition -- the annual International Jaguar Festival. 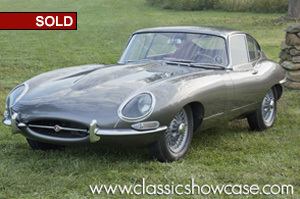 Today, Classic Showcase is pleased to offer this painstakingly crafted and highly correct early E-Type coupe to discerning collectors worldwide. The serious Jaguar collector now has an opportunity to acquire Car #041, an exceptionally rare, rotisserie restored classic that is in many respects better than when delivered new from Coventry, England in 1961. Furthermore, the car is already a National Champion—its next owner may easily continue to campaign the Coupe as he or she sees fit. As a very rare, first generation, early production number XKE Coupe, this example also stands as a prudent investment given its 18 September 1961 production and iconic status in automotive history. Now is the time to own and experience one of our greatest restorations ever performed on an XKE. 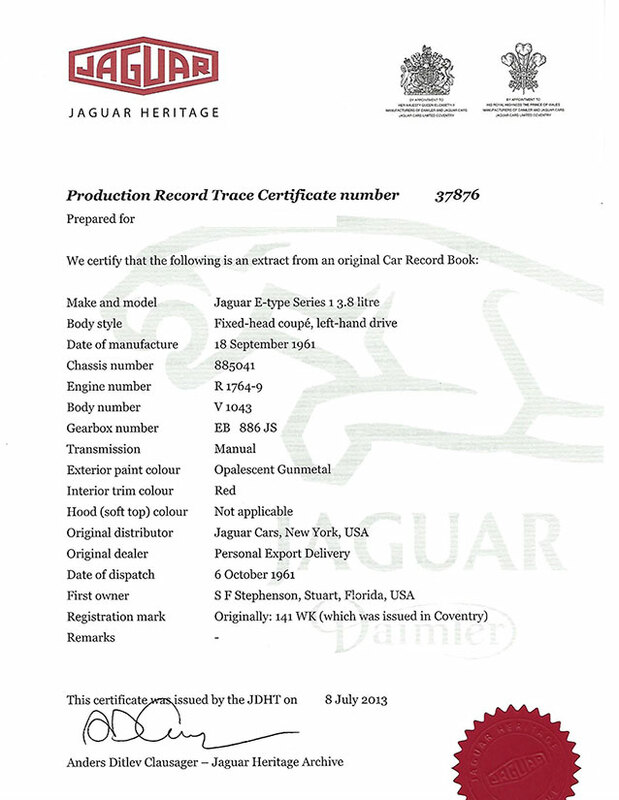 A flash drive of the restoration process, along with a Jaguar Heritage Production Record Trace Certificate, accompanies the vehicle. E Types from 1961 to mid-1962 had several very distinctive features associated with the rear-end body shell (noticeably at taillight assemblies), boot lid assembly (including glass pane), flat floors, and welded louver bonnets. Other early E-type features included an aluminum dash and center console and early style bucket seats. Jaguar XKEs featured a monocoque passenger compartment and tail section, a tube-framed engine bay, and a tilting bonnet. With its well-appointed interior, civilized 3.8-liter six-cylinder engine, and compliant suspension, the XKE was an ideal two-place sports car. The early XKE coupe has the looks to die for, with its sweeping lines and an aggressive yet undeniable sensual stance. All of these features make this beautiful XKE a highly desirable opportunity for the discriminating collector!